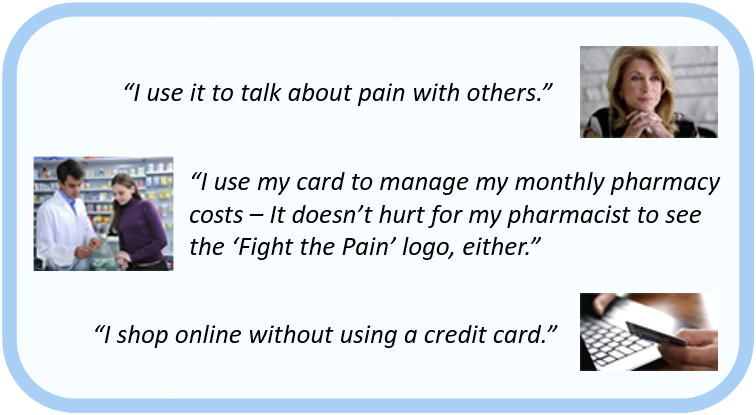 The National Pain Report – Fight the Pain Visa® Prepaid Debit Card can help you save money, track spending and safely make transactions online. You can also choose to load a specified amount through direct deposit each month, allowing you to manage your monthly budget to be spent from the card. If you need to spend more one month, load more. No overdraft fees or penalties. If you use less money one month, the money will accumulate on your card. National Pain Report primarily saw the Visa Prepaid Debit Card as a great tool in managing monthly chronic pain expenses without ever worrying about credit checks, overdraft fees, or high interest rates; however, you can use your card for whatever you want. It’s your money, manage it how YOU want to, without worrying about penalties and fees. Enrollment is fast and easy. You can securely use the card anywhere that Visa debit cards are accepted, including retail shops, ATMs and for online purchases. * While this feature is available for free, certain other transaction fees and costs, terms and conditions are associated with the use of this Card. See Cardholder Agreement for more details. ** Important information for opening a new card account: To help the federal government fight the funding of terrorism and money laundering activities, the USA PATRIOT Act requires all financial institutions and their third parties to obtain, verify and record information that identifies each person who opens a card account. What this means for you: When you open a card account, we will ask for your name, address, date of birth and other information that will allow us to identify you. We may also ask to see your driver’s license or other identifying documents. “Guaranteed Approval” is contingent upon passing this mandatory identification confirmation.National Pain Report Visa Prepaid Debit Card is issued by MetaBank®, Member FDIC, pursuant to a license from Visa U.S.A. Inc. This card can be used wherever Visa debit cards are accepted and use is governed by the terms in your Cardholder Agreement. Visa is a registered trademark of Visa U.S.A. Inc. © 2015 Prepaidian, Inc. All Rights reserved.